For the past 25 years I have wanted to photograph the Avon Descent but there has always been something else on the same weekend. Today that dream was realised. The alarm went off at 4.00am and by 4.15am I was on my way. I arrived nice and early to set up at the position I located last week when scouting out locations. 500+ images later and I was very happy with what I had captured. Stay tuned for the gallery to come. I was aiming to capture a sunset with a little difference from the usual “sun visible to the lens” of the camera. In this image the sun is behind the buildings which allowed for better exposure of the foreground. I am excited to announce I will be holding my first exhibition in November featuring my Landscape and Wildlife photography as a joint project with artist Marilyn Fahie of “Art By Marilyn”. Stay tuned for further details to be announced soon. 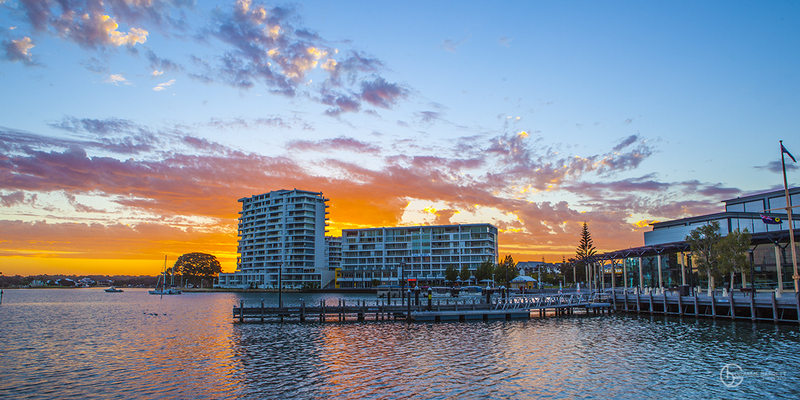 Dolphin Quay at Sunset before the storm which ended up bypassing Mandurah. 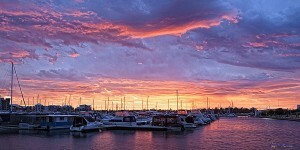 This weekend I am judging this months entires for the Rockingham Camera Club. I will be attending their meeting Tuesday night to announce the awards and share my experiences as a photographer. Welcome to all the new people who have liked our Facebook page this week. Our first competition will be launched soon. Stay tuned for more details. If you haven’t liked our Facebook page yet, head on over to http://www.facebook.com/pages/Graeme-Barrett-Photography/158363171783 and LIKE it today so you can be in the running for our competitions.